Rachel lives with her mother on The Property. THe good thing about living there is that it's far from the city, where the oppressive government is most active. The bad thing, at least to most people, is that it's close to the Line - an uncrossable section of the National Border Defense System, an invisible barrier that encloses the entire country. She can see the Line from the greenhouse windows, but she is forbidden to go near it. 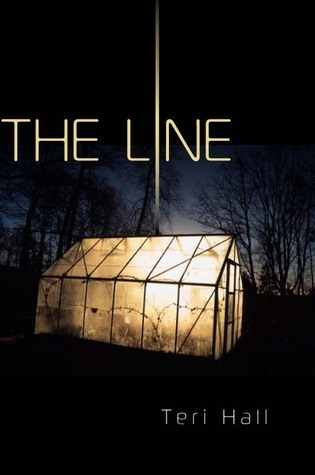 Across the Line is Away, and though Rachel has heard many whispers about the dangers there, she's never really believed the stories. Until the day she hears a recording that could only have come from across the Line. Who sent the messenger? What is her mother hiding? And to what lengths will Rachel go in order to do what she thinks is right? Written in mesmerizing prose, this futuristic debut examines one girl's struggle to risk crossing - not just the barrier, but the lines her mother has drawn to keep her safe from the secrets that Rachel is only just beginning to discover. Rachel has spent most of her life living on The Property, where her mother works as a maid for the reclusive Ms. Moore - and only walking distance from The Line that divides what's left of the United States from Away. She has so far been able to resist the temptation of Away, but then she discovers a communication from the other side, and her whole life turns upside down. I bought this book a few months ago but only just got around to reading it. While an interesting story, it turned out that the main character, Rachel, was a lot younger than I thought she would be, and, as a result, the story was more juvenile than expected. 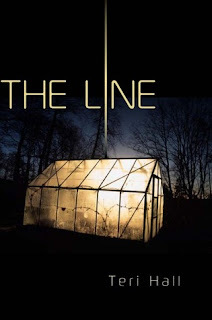 The Line has all the typical characteristics of a dystopian novel - a totalitarian government, society without frills beyond the necessities, and an inability to leave. What it lacks, however, is action. The story tends to drag until right up to the end, when the action finally starts. I have high hopes for the sequel, Away, though, considering how The Line ended. The second book in the series, Away, will be released in September 2011. Only in english :). I'm better at talking and reading english than writing it ^^. It was great I uderstood everything she said and I was able to talk with her very easily ! OMG i'm sorry I haven't read corretly your question -_-. No Maggie only spoke english during the lunch ! She doesn't speak french. She just knows how to say how are you and what's your name in french ^^. Your french is well :O !! Congrats :D ! Well there were just Fleur and me who spoke, the other two didn't know how to speak english with Maggie :/. And yeah I've had a great time :D Maggie is one of my favorite writer so I was very happy to meet her !